The Gulf Thoracic Congress 2013 is the fourth joint meeting of the Saudi Thoracic Society (STS), in collaboration with the Emirates Allergy and Respiratory Society (EARS) in collaboration with the American Thoracic Society (ATS), the European Respiratory Society (ERS) and (for the fourth time), the Cleveland Clinic Foundation (CCF). Would include all specialties related to Thoracic Medicine, which includes but not limited to: Pulmonologists, Thoracic Surgeons, Allergist & Immunologist, Intensivists, Respiratory Oncologists, Internists, Primary Care Physicians, Radiologists, Pharmacists, Scientists, Respiratory Care Specialists, Technologists, Nursing Staff, as well as advocates and Researchers in Public Health and Health Promotion, including Environmental and Occupational Health. 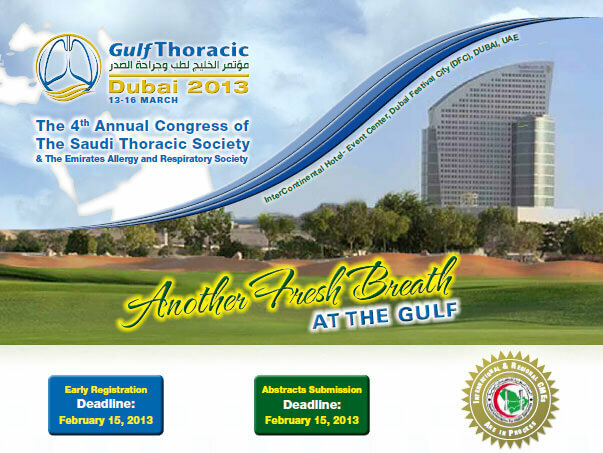 Gulf Thoracic 2013 aims to create a platform for regional medical practitioners to engage exchange and experience the latest and best practice methods in Thoracic Medicine.